When I started reading the bible, I passed over many parts of the Scriptures because I did not understand the meaning of certain words, or I did not know the history of the peoples, or their manners and customs. When I studied the above items, I found a richness, a more full appreciation for many of the stories I read about in the bible. I began to see God's truths come alive. I began to see those written of as real people and not just names that I can't pronounce. As I gained a greater knowledge of what the bible was saying I found the Holy Spirit was showing me more and more connections between the different parts of the bible. I wanted to help every one else to also gain a greater pleasure in reading the bible, by helping them to also gain an understanding of the little things in the bible, for many of these little things are direct pointers to God's truth. I know that most people do not have either the time or the resources to undertake such a study on their own, even if they had the desire. So this Web Site is for those who wish to learn more about the bible. Most of The articles posted here were previously printed in my Newsletter which I had published for five years with additional articles added from time to time. I have published both original works of mine and works compiled by me. There will also be some articles, from time to time, that have been submitted by other authors for publication, or by authors who have given me permission to reprint their works. All articles other than my own are copyrighted by the author. It is my belief that God's word must be spread to the entire world without cost to those who hear or read His word. (Mark 16:15 And he said unto them, Go ye into all the world, and preach the gospel to every creature.) In keeping with this, For the Articles, or parts of articles, with my by-line "Rev. Jack Barr", I place into public domain, that you may copy and help spread them to all who will listen. My time is limited so please do not expect an answer immediately. I will be very selective on what I will answer to. If you respond because you disagree with one of my articles, please include the verses from the bible to back up your statements. Please do not quote from any other documents, writings, books, etc. As they are all mans works, and not God's. This is my statement of faith. Printed so that those who read this Web Page may understand my beliefs. I do not, nor have I ever adopted the doctrines of any Christian denomination, that is to say, I have not changed my beliefs in order to match their doctrinal beliefs. These beliefs listed below are MY beliefs, because I have found them to be true from my studies in the Bible as I searched for the truth of God's Word. I do not support the beliefs of any Christian denomination unless they can be documented and proven in the Bible. 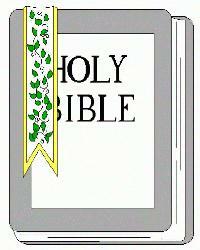 I recognize only the King James Bible as the True Word of God. However, If any of you find fault with what I publish, or teach in this newsletter, I would ask you to write to me about it. I also ask that in writing, that you also quote Scripture to back you up. I welcome any comments, positive or negative. Now for my statement of faith. I believe the one true God has revealed Himself as the eternally self-existent "I AM", the Creator of heaven and earth and the Redeemer of mankind. I believe that man and woman were originally created in the image of God, good and upright, but fell into sin by voluntary transgression. All mankind thereby incurred, not only physical death, but also spiritual death, Which is separation from God. Only through regeneration by the Holy Spirit can Salvation and spiritual life be obtained, for sin has alienated sinners from God, darkened their minds, crippled their wills and made them unfit and unable to serve God. I believe that it is the loving grace of God that is the source of our salvation and that it is only through the shed blood of Jesus Christ on the cross for us, and His resurrection, that provides the only way for our justification and salvation. Jesus took our sins upon Himself, was judged in our place, and gives His righteousness to us. This work of grace provides salvation for all who believe and repent toward God, having faith toward Jesus Christ, and only those persons who receive Jesus Christ by faith, are born of the Holy Spirit, thus becoming the adopted children of God. I believe Sanctification is an act of separation from that which is evil, and of dedication unto God (Rom. 12:1-2; 1 Thes. 5:23). Sanctification is realized in the believer by recognizing our individual identification with Christ in His death, and resurrection, and by faith calling daily upon the fact of that union. (Rom. 6:1-11, 13; 8:1-2, 13; Gal. 2:20; 1 Pe. 1:5; Philip 2:12-13). I believe Sanctification is both instantaneous and progressive. I Believe that Divine healing is an integral part of the gospel. I believe that deliverance from sickness is provided for and is the privilege of all believers. I believe the Baptism in Water by Immersion is commanded in the Scriptures. All who repent and believe on Christ as Savior and Lord are to be baptized. By this Baptism, they declare to the world that they have died with Christ and that they also have been raised with Him to walk in newness of life. I believe in partaking in Holy Communion, the Lord's Supper, consisting of the elements of bread and the fruit of the vine, in remembrance of our sharing the divine nature of our Lord Jesus Christ (2 Pe. 1:14); as a memorial of His suffering and death (1 Cor. 11:26); and a prophecy of His second coming (1 Cor. 11:26); and is commanded of all believers "until He comes." I believe that all believers are entitled to receive the Baptism in the Holy Spirit. They should expect, and earnestly seek, the promise of the Father, which is the Baptism in the Holy Spirit and fire, according to the command of Our Lord Jesus Christ. I believe that the initial sign of having received the Baptism in the Holy Spirit is the physical sign of speaking with other tongues as the Spirit of God gives them utterance. The speaking in Tongues in this instance is the same in essence as the gift of Tongues, (1 Cor. 12:4-10, 28) but different in purpose and use. I believe that Christ will return to earth with His saints to reign on earth for one thousand years. (Zech. 14:5; Mat. 24:27, 30; Rev. 1:7; 19:11-16; 20:1-6 And that this will establish universal peace (Isa. 11:6-9; Psa. 72:3-8; Micah 4:34). I believe that there will be a final judgment at which the wicked dead will be raised and judged according to their works. Whosoever is not found written in the Book of Life together with the devil and his angels, the beast and the false prophet, and Hell, will be sent into everlasting punishment in the lake which burns with fire and brimstone, which is the second death. I Believe that God will totally destroy this earth and the present heavens and will create entirely new heavens and earth where only righteousness will dwell. There they are, my beliefs, which I base on the Bible. May each of you study the bible for God's truth, and not accept blindly what any man says, or writes.